Of all the cities in Northern Nigeria, Kano is perhaps the most important. Although it used to be subject to the Sokoto Caliphate, in many respects it has since become a far more important city in Nigeria than Sokoto. Kano was the administrative capital of the entire Northern Nigeria under British colonial rule. Today, it is by far the biggest metropolis in Northern Nigeria. It is not only the vibrant commercial capital of the region; it is a leading epicenter of economic activity in sub-Saharan Africa. Kano is also in many respects the most truly progressive state in Nigeria. It has never been a follow-the-leader city. The people of Kano have a mind of their own. They specialize in bucking the national trend. Kano is the city of trail-blazing Mallam Aminu Kano and the Northern Elements Progressive Union (NEPU), which later became the formidable People’s Redemption Party (PRP). It is also the city of Maitama Sule, another one of Nigeria’s former luminaries and perhaps the most distinguished orator ever in the history of Nigerian politics. For these reasons and more, the politics of Kano have far-reaching regional and national implications. It also goes without saying that the Emir of Kano is inevitably a very influential man, not only in Kano and the North, but in Nigeria as a whole. By virtue of his office, a lot of people look up to him. His views go a long way to shape public opinion in the Northern part of the country and even beyond. This makes the choice of the Emir of Kano more than a local affair. It is a choice that must be made soberly and with great circumspection as befitting such a local office of national significance. This makes the choice of Lamido Sanusi, the disgraced former Governor of the Central Bank of Nigeria, as the new Emir of Kano most inappropriate. It is a choice that, wittingly or unwittingly, will bring the office of the Emir into disrepute. It is improper that a man who still has allegations of financial improprieties hanging over his head at the national level, to which he might have to answer in the court of law, should be appointed to such an important post. This is how Nigerian leaders show they have little or no understanding of the ethics of public office and good governance. Lamido Sanusi has just been fired as CBN governor on allegations of corrupt practices. How then can such a man be rewarded with the appointment of Emir of Kano before his innocence is established? This is the Nigerian way and it is the way of ignoble and corrupt practices. Sanusi’s appointment to such an important post could not have taken place in countries concerned about probity and transparency in public office. His appointment confirms the allegations of our gaggle of Western traducers that Nigeria is a citadel of corruption. It tells the world that Nigeria deserves to be one of the lowest-ranked countries on the corruption index of Transparency International; a global civil society organization that engages in comparative analysis of the levels of corruption in the countries in the world. Sanusi is accused by the federal government of running the accounts of the CBN like a bull in a china shop. It is only in Nigeria that you can have a Central Bank governor spend government money as outrageously and as whimsically as Sanusi is alleged to have done. The government reveals that Sanusi gave away nothing less than ₦163 billion in 63 unauthorised “intervention projects” in different parts of the country. This largesse is more than the entire annual budget of a state like Edo. He is also accused of being guilty of a number of grave financial improprieties. Will he now get away with these corrupt practices simply because he has been appointed as Emir, or will he be prosecuted to the full extent of the law? Your guess is as good as mine. If the charges against him are dropped simply because of his appointment, it will be another example of Nigeria’s tendency to condone corruption. Even the former prime minister of Israel was tried and sentenced to jail for corruption, which is what happens in those countries with zero tolerance for the improprieties of public officials. The question now is whether the Emir of Kano is beyond the law. Another question is whether Nigeria a real republic or no more than a banana republic? The Emir of Kano does not have any constitutional immunity from criminal prosecution. If Sanusi is prosecuted in spite of his appointment and found guilty, it would undoubtedly be demeaning to the office of the Emir of Kano when and if he is ignominiously sent to jail. Indeed, he would be the first Emir to be granted such distinction in Nigeria. While every Nigerian must be deemed innocent of all charges until proven guilty in a court of law, commonsense dictates that you do not appoint a man with criminal allegations hanging over his head into high office until he has cleared himself of those allegations in the court of law. This makes the appointment of Sanusi as Emir by Governor Kwankwaso of Kano an act of deliberate mischief. The Nigerian Senate recently declared Sanusi a liar and mischief-maker for making false allegations that a whopping 49 billion was missing from the federal accounts. A liar and mischief-maker is not suitable for the politically-sensitive post of Emir of Kano. Governor Kwankwaso himself was accused of being a fraudster by no less a person than Goodluck Jonathan, the President of Nigeria. What we now have is that an alleged fraudster has appointed another alleged fraudster into high office, undermining the reputation and integrity of the important city of Kano. Are there no protocols concerning the appointment of Emirs and Obas in Nigeria? Certainly there must be. Even if there is none, should propriety not tell Kwankwaso that a man facing corruption charges is not be eligible for political appointment? Only in Nigeria does this kind of disregard for ethics and good governance hold sway. Since this is coming from one of the new kingpins of the APC, who is even being touted by some as presidential- candidate material, what does it tell us about “fresh air” that the APC claims it will bring to Nigerian politics? It tells us that the APC is one big charade. Make no mistake about it: this is a political appointment. Even more pointedly, it is an APC appointment. Governor Kwankwaso who made this appointment is a rebel PDP Governor who recently defected to the APC. He would not have made the appointment as a PDP governor. This appointment was made to spite the government of Goodluck Jonathan. But what small-minded people like Kwankwaso don’t seem to understand is that when they undermine the government of the Goodluck Jonathan, they are undermining the government of the Federal Republic of Nigeria. One of the allegations against Sanusi by the federal government is that he is suspected to be one of the financiers of Boko Haram. The fact that the man is now appointed as Emir, without these allegations being ironed out, is further evidence that some Northerners are not ready to confront the issue of terrorism in the North. If they were, a man facing terrorism-related charges by the federal government would not be the preferred choice as Emir of Kano, a city that has been attacked severally by the Boko Haram. By this act, Kwankwaso has made himself an unworthy governor of Kano. Only an unworthy governor would turn such a revered institution as the emirate of Kano into political football. Kwankwaso has made the people of Kano into a laughing-stock. Revered institutions like that of the Emir of Kano should be beyond the shenanigans of this type of political manipulation. I have said it before and I say it again: there is nothing progressive about the APC. 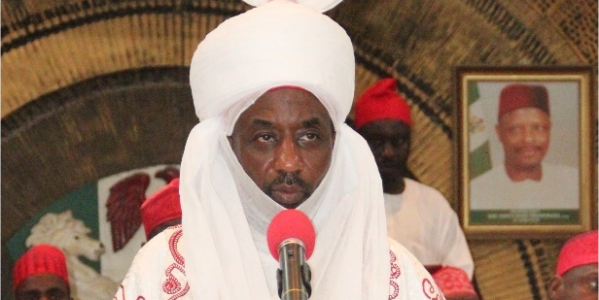 This appointment of Sanusi as the new Emir of Kano is further proof. What the APC bring to Nigeria is the same tired old-time corrupt politics that has been the bane of the country for the longest time. The APC is one big con. Unfortunately for Kwankwaso, he chose the wrong state to do this prank. Kano is a highly volatile city. The people are not going to take this appointment lightly. Already, there have been a number of violent skirmishes since the appointment. Kwankwaso has lighted a bush-fire whose consequences may be more than he bargained for. You can never tell how far Kano citizens who have been brazenly disrespected by the governor will go in registering their protest. In any case, Kwankwaso’s act is sure to backfire against the APC in Kano. This means we have not yet heard the last of Kwankwaso’s treachery. If Lamido Sanusi were wise, he should spend some time reading the tea-leaves. Some people are already concluding that Sanusi is the new Emir by divine providence. However, appointments as Emir or even as Sultan are no longer sacrosanct. Mustapha Jokolo was removed as the Emir of Gwandu in 1995 and replaced by Mohammed Jega. Ibrahim Dasuki was removed as the Sultan of Sokoto in 1996 and replaced by Muhammadu Maccido. Therefore, this is a piece of advice for the new Emir of Kano. Don’t bother to move your belongings into the Emir’s palace just yet. Don’t even bother to change the curtains or the carpets for now. You may not be on your throne for long. Thanks to Kwankwaso, the Kano Emirate has been politicized to all effects and purposes. Today, it is clearly in the APC camp. But if the APC lose the governorship election in Kano in February next year, it is not improbable that the Emirate will immediately be declared as a PDP terrain. In that case, His Royal Highness, the new Emir of Kano, might end up with the same fate that befell him as CBN Governor. He might be summarily dismissed.